We are very proud to say that our founder Emma is a fellow of the School for Social Entrepreneurs (SSE), taking part in the program in the East of England, being a member of the 2015/16 cohort, you can see her profile by clicking here! The programme is sponsored by Lloyds Bank and the National Lottery. This journey first started in early 2015, when a friend and fellow social entrepreneur suggested Emma applied to the SSE. There were several stages in the application process, culminating in Emma having to pitch for Dragon’s Den style to a room of people, which at the time was quite overwhelming. 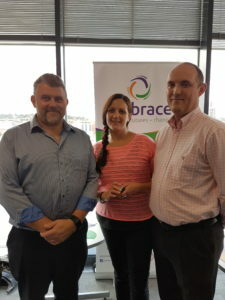 Luckily Emma was successful and spent the next year learning all the skills needed to become a social entrepreneur, which in simple terms means running a business with social aims, in the case of Embrace PFC CIC, this is a non-for profit organisation, creating real social change and benefit. Being a part of this meant Emma could realise a dream of hers by making a real change to the lives of people who may not otherwise be given the opportunity or support they deserve. As a part of the SSE journey Emma has a mentor from Lloyds, Andy Donnison, who has offered a huge amount of support and we know Emma is extremely grateful for this, Andy still keeps a keen eye on any updates. Below you can see a picture of Andy, Emma and fellow director Duncan below on the day of the graduation.